1. A random oscillator emerging from chaos to self - organization. 2. That the oscillator (in this case - DNA) is mutating toward COMPRESSIBILITY. 3. 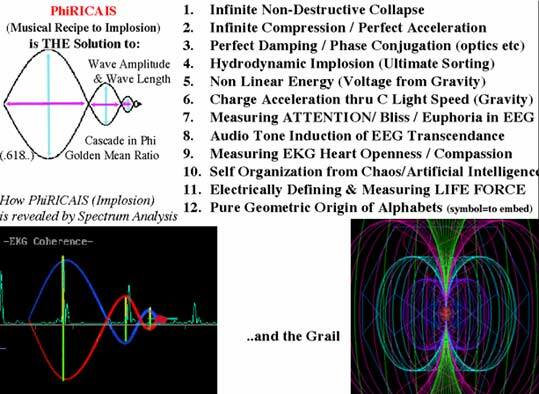 The electrical geometry of IMPLOSION / the essence of self-organization and chaos emergence. spectral emissions of genetic material. Meaningful broadband spectral data from DNA resonance in ANY of these bandwidths could prove the concept. based on my work on the wave mathematics of recursion, from the University in Lisbon, reprint soon. Lays the theoretical foundation for HOW waves become self organizing in any biological oscillator. Providing the essence of the principle for the origins of self awareness in DNA. .: Click here to view / print - preliminary version of this paper.
. We can prove by Spectrum Analysis Determining DNA Implosion That Genetic Researchers Must Take into Account Braid Recursion / Embedding Structure - WHICH WILL COME TO DEFINE ENSOULMENT IN THE GENES. All we need is access to existing academic research which takes spectral emissions of DNA in any one of several frequencies (audio/phonon , uv , rf , microwave , infrared , etc.). And we could apply this mathematics of embedding to PROVE to genetic engineers that their failure to understand BRAID implosion in the structural nesting of DNA, could cost our children their soul. In other words, we show when the harmonics of DNA begin NON-DESTRUCTIVE COMPRESSION, and we can give a whole to meaning to SELF ORGANIZATION in genetic material! Introduction: The core of DNA is clearly inhabited by a wave of electrical charge whose geometry is the MOST self-similar or fractal of all the waves of nature. The major message is precisely the self-similarity in the geometric core of DNA - is proof that the electrical waves in genes ARE self-aware. This means they need more respect. A. He learns to be gentle with DNA - the little wormy things, because they FEEL!!!!! B. He learns that the perfect connectedness which is at the core of DNA means - no messing with it's geometry until that meaning of that perfect FIELD UNIFIER - - "All is GOD" connector is understood. C. DNA will be understood as an electrical implosion device designed to steer the waves of charge into recursion which we have previous known by little understood word: GRAVITY. Simply put, DNA was designed to properly compress and IMPLODE the electrical waves to MAKE gravity. This relates to the role of DNA in embedding in, and thus steering TORNADOES. The shamanic way of steering a tornado like an obedient puppy, is described in physics as the geometry of embedding. This psychology of compassionate FEELING FOR something, is measureable mathematically as the frequency signature of self similarity. D. The realization that the future survival of our genepool probably requires an explicit understanding of what 'squirts' thru light speed out of DNA. When harmonic velocities build up faster than light speed, ultimately an infinite number of wave VELOCITIES as well as wave lengths can converge at one point. This evolution to implosion linking wave fronts between multiples of C light speed, is in physics the essence of what is LIFE itself. It requires so much recursion and self similarity of wave structure, that only DNA based systems maintain the wave nesting properly. The input data in the form of a frequency signature -from any one of the above spectral regions- would be fed to the modified SEPTRUM form of the 2nd order FFT as used in heartlink. The output would be the form of the 2nd order fft display below 2 hz - first peak amplitude equals radical new COHERENCE MEASURE, first peak POSITION (inverse to musical fundamental of the DNA measured ) would indicate log PHI harmonic (membrane bridging) when genetic material was succeeding in implosion / self organization, versus log 2 harmonic when moving toward cancer and related MEMBRANE MAKING syndrome. The radical hypothesis of this research experiment - is that DNA self-organzation can be measured and taught by harmonic analysis (and SUSTAINED in self-empowerment using proper charge dense symmetry - known as BLISS - see The Purpose of Genes:Bliss vs. Money?,Government Based on the VALUE of Bliss? "What would happen if a culture as a whole recognized that what creates survival in genetic material is the physics of bliss?" However, regardless of the result of this test, DECODE GENETICS could rather quickly assemble a tabular correlation of key spectral signatures based on elegant 2nd order FFT / septrum data, to correlate disease tendancies with spectral identifiers. 4. Keyword: "Signature Sound Works"
yellow is the persons EEG, blue is the EKG. Note the musical fundamental (EI - Emotional Index / inverse ) is remarkably close to .62 Golden Mean ratio. The original concept that "CONTEXT DEPENDENCY" which I have quantified as braiding / harmonic analysis, is the MECHANISM which makes DNA (as an information relaying waveguide device) signal to noise ratio very high, is here acknowledged to "Grammatical Man - Information, Entropy, Language and Life" book by Jeremy Campbell. The essential message here is that codon sequences in themselves are only the machine code of DNA, the groupings - disciplined as braiding - measured by FFT - are the high level programming language. 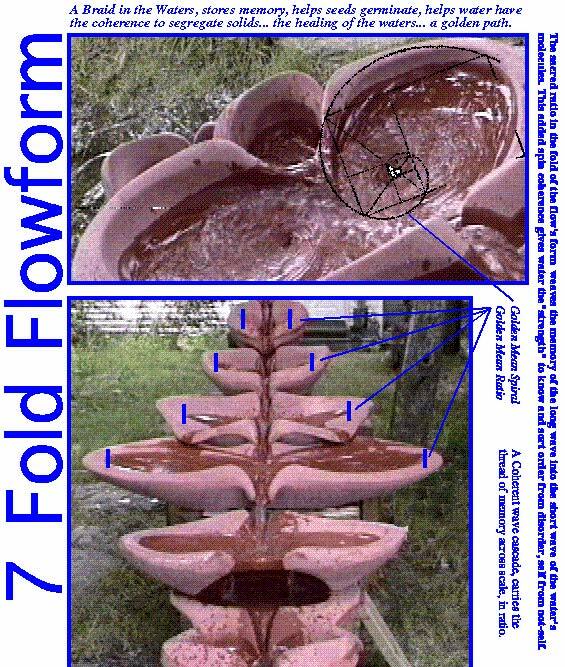 And further that these groupings or nesting units, assembled into wave envelopes by the piezoelectric sound pony tail of human emotion, program which sites are active and replicate to the RNA by selecting which are mechanically tucked INTO vesus OUT OF the braid. (which determines which ones RNA gets access to ). DNA RESONANCE: How's The Radiance of Your Magnetic X Today? (about the onset of COHERENCE in DNA BRAID as critical to genetic engineering - by Dan Winter, in collaboration PhD Biophysicist - Adonia McKinzie) . The Dizzy DNA syndrome, (lack of self-organization) is caused when genetic engineers fail to prioritize what EMBEDS long waves in DNA. Why DNA's interstitial spacing is NOT - JUNK DNA-http://www.inter-dimensions.com/en-us/pg_62.html the vibrational behaviour of the DNA. : "Living chromosomes function just like solitonic-holographic computers using the endogenous DNA laser radiation." This means that they managed for example to modulate certain frequency patterns onto a laser ray and with it influenced the DNA frequency and thus the genetic information itself. SuperConductant DNA vs. Braiding and Sustainability / "Ensoulment"? "BRAIDING DNA IS EMOTION THE WEAVER?" Fusion-Phi Phenomenon-Unlocking Ultimate PHIre. , Is the key to cold fusion - the strangely DODEC shape of palladium - held within the Dodeca wratchet that is DNA's 'phi' geometry. Along with "The Phi Phenomenon" key to VISUAL Fusion, is the possibility of FUSION at the Atomic Level, intimately linked to the pure principle of Golden Ratio based PHI Embedding with all the Implications of creating self-organizing/self-aware wave systems this implies..? The Perfect Geometry of Wave Collapse - Neurophysics Solution the Nature of Consciousness (Our project here would apply this concept of perfect wave collapse geometrically, using FFT -harmonic analysis- to DNA). Braiding DNA, Is Emotion the Weaver? DNA "Grooving" Measureably Closer to PHI Embedding with Time? Main Compression / Scale Invariance - How to Spin to the Center of THE Tornado.. "You couldn't get a better squeeze" - article_. ../bettersqueeze/squeeze.html , DNA is like the toothpaste you do NOT buy for the value of the tube- but rather for the value of what squeezes out. Is making a soul the result of compressing by perfected recursion of a sustainable tornado thru the speed of light up the zipper of DNA? - and does that perfect squeezing or charge compression of genes correspond to the capacitive 'condensor' nature of human bliss / igniting DNA to implode - self empowered and from the inside out.? EMBEDABILITY MONITORING-AS THE HEART GEOMETRIZES, SO FEELING EMBEDS..Now we have discussed elsewhere, that this skill to get DNA braided so that it's field effects EMBED implode themselves into anything outside them. And that this skill to get the structure of DNA aligned into this perfect self-containment, apparently emminates from the Heart. It's simple a sonic pony tail from a coherently ecstatic heart, does the braiding of your DNA which lines up the short waves (codon sequences) to the long waves (long sonic envelopes in DNA's braid). This then allows the slinky wave mechanics to add and multiply recursively up and down the ladder, accounting for the wave velocities eventually heterodyning or simple beating thru lightspeed. 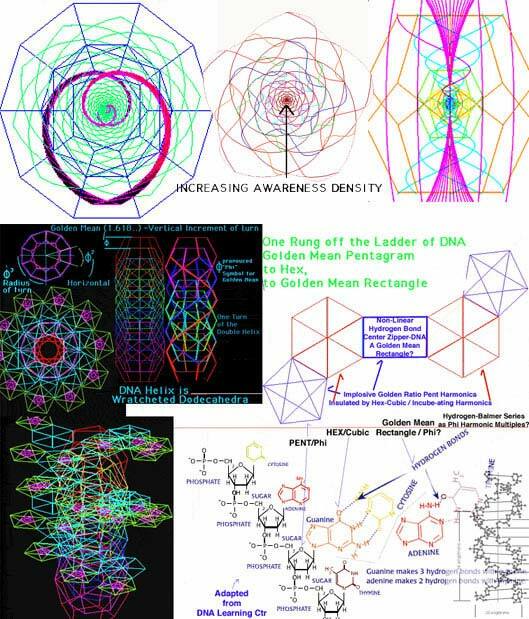 (../superDNA ) Faster than light implosion lightning at the center of DNA is measureable (William Pensinger) (same for gold filaments under hi amps!). For the physics of how this properly heart induced implosion accounts for the gravitation we call black holes etc. (the solution to Einstein's quandry to model the geometry of inPHIkni implosion to understand why black holes bend time).. please see: ../predictions . 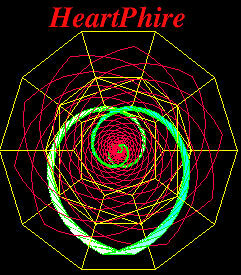 Using the Heart Harmonics to Ignite the Earth Grid, Animations! Heart Rate Variability and the Breath? 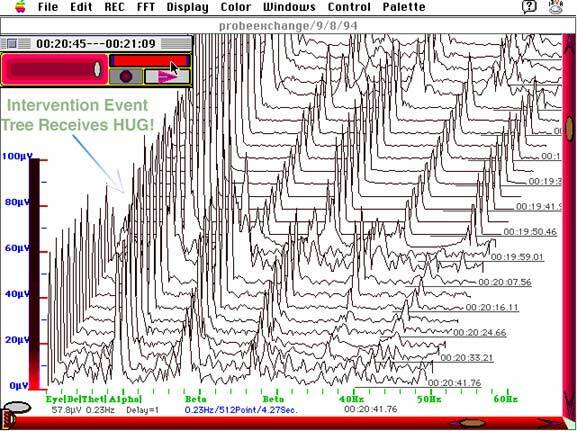 Embeddability Monitoring Breakthru for HeartBeat2000. The Mathematics of Self-Awareness: - A Proposal For A Global Media Self-Awareness Feedback Project. Implosion-Fusion-Grail Research - Genepool Immortality from the PRINCIPLE of COMPRESSION. Pursuant to Our Meetings This Year and Proposed Upcoming Work There. Project I - Prove That Implosion Based EKG Feedback and Neurofeedback Can Sustainably Eliminate Addiction and Attnetion Deficit Disorder - In the Process Practically Replacing Drugs for Young People With Self Empowering BLISS Process : Reinventing RAVE. Suggests Powerful New Solutions to DRUG Use Among the YOUNG - Using Music Tuned to Bliss (Phi) Harmonics AND Biofeedback to Make SELF EMPOWERED Bliss Teachable - Eliminating the NEED for Drugs / Addiction. Project II - Prove that Life Force and 'Quality of Life Energy' can be Defined and Measured and then Optimized by Harmonic Analaysis. We Amplify then Spectrum Analyze to Determine IMPLOSION ONSET (2nd order FFT: the Septrum - as in HEARTLINK) the Capacitive Field around ANY Living Substance to Compare it's LIFE ENERGY and SELF ORGANIZING Capability. 2 Major Variables tell us it's LIFE FORCE Comparison - both come from the SEPTRUM - a.) the AMOUNT of INTERNAL COHERENCE as a complex oscillator - as indicated by the AMPLITUDE of the first harmonic peak of the SEPTRUM , and b.) The POSITION or Value of that Septrum 1st Peak indicates a MUSICAL FUNDAMENTAL which is GOLDEN RATIO INSTEAD OF OCTAVE when IMPLOSION / SELF-ORGANIZATION onsets. Example : Schaubergers Piezoelectric Water Implosion Vortex to Make Electricity from Gravity began when COLDNESS increased - which with this technique we can now MEASURE and optimize. note the Schumann harmonic in the cascade... Note at arrow how human emotion measureable effects this tree. Other examples of emotion effects measured on trees: Measuring the Effect of Tree Hugging! Project III - World Touch University: (VIRTUAL UNIVERSITY on CD as delivered earlier to you. ) - . The Harmonic Geometry of PEACEMAKING in Principle. Prove that PEACE on the LAND is CREATE-able by extending the SACRO CRANIAL Principle that by adding ATTENTION to TOUCH - FUSION / Implosion by PHASE SORTING is Created in the Spine. This means we can enact that same IMPLOSION symmetry which heals the SPINE Pump to BLISS - by arranging LONG WAVE MAGNETIC LINES to Fractal Rose like geometry on the land. Villages and towns find that the EMOTIONS can touch and NOT DESTROY (non-destructive compression) across the land. a.) We measure soil magnetic flux permissivity (which when it is NOT present - my friend Professor Phil Callahan illustrated is a predictor of WAR ) , b.) We rearrange long wave magnetics in the LAND - with LABYRINTHS, DOLMEN, FENG SHUI - GRID ENGINEER - GEOMANTICS - see 'Uriel's Machine' - and "Bill Witherspoons" Land Sri Yantra Eliminates Desert - Even restore the CLIMATE pattern out of CHAOS by Fractality in the MAGNETICS between Jet Streams , Tectonics , Ley Lines the Size of Mountain Ranges. In summary - we teach that THE ONLY PATH OUT OF CHAOS FOR ANY WAVE SYSTEM IS THE IMPLOSION PATH - WITH - HEART OF EMBEDDING by FRACTAL and SELF SIMILARITY. To SELF ORGANIZE IS by PERFECT EMBEDDING is to BECOME SELF AWARE and END THE NEED TO DIE - the PERFECT PEACE - fullness. 3. Does The Prize of PEACE Depend on Understanding the Pure SCIENCE of What Peace IS ? Paper sent with CD to our Interface with the Nobel Peace prize Committee - "Does the Prize of Peace Depend on Understanding the Pure Science of What Peace Is? : The SYMMETRY OF MAGNETISM That Embeds or Nests Perfectly - On the LAND and IN THE HEART and MEASUREABLE / Teachable. 5. Report on Nobel Peace Prize Committee Project to Teach Peace by PRINCIPLE OF EMBEDDING - from Pamela Hiley in Oslo, Norway. Refining our extensive research that PEACEMAKING can be taught scientifically, as a field effect which self organizes mathematically - and permits TOUCH - first at a human individual level - then at a community level . 2nd - on the land -- Long wave magnetic grid tuning (labyrinth / grid aligning for 1st neighborhoods - then whole bioregions. Rearranging land to embed - become rose like in fractality of long magnetic lines - could save the Earth from Solar extinction! Proving that fractalizing the arrangement of long magnetic lines in demonstration project bioregions, could easily prove more that effect on microclimate and even global warming. As the solar maxima approaches, those bioregions which do not acheive compressibility will be doomed. (heat making). This applies as much to DNA made braid shareable compressible as it does to bioregions. Originally it was spectral harmonics of plate tectonics which predicted Earthquakes (.. Trombley, Bill Bise et al). Now we can extend this model to predict which bio-regions can withstand solar maxima magnetics. This is the language of physics telling us what will survive the 'rapture'. Project VII. Using Heart Harmonics in a Self Empowered Biofeedback Game Environment to Empower Young People to Created a Global Mind based on Entrained Hearts. Harmonic Module:Global Heart Entrainment Dream-ReAssembles-HeartBeat 2000 - Through One Heart into the New Millenium ,.. HeartBeat 2000 Update:Project Goes GLOBAL!,.. The Harmonic Module,A PLAN FOR A GLOBAL MEDIA BIOFEEDBACK VISUAL EVENT. as sources for this article by sending a request to cbns@cbns.qc.edu. prowess, though marvelous and complex, are nonetheless safe and reliable. nucleotide sequence that generates multiple proteins. Cell: The fundamental, irreducible unit of life. replication and engenders a specific genetic code trait. structure that specifies their biochemical activity. term's meaning has become increasingly uncertain. sequence of four kinds of nucleotides found in the nucleus of living cells. Nucleotide: The four kinds of subunits of which nucleic acid is constructed. refutation of its own scientific rationale. out with a meaningless set of random numbers. happens to find itself, even in a different species. identity of the protein and the inherited trait that the protein creates. genes, on their own, can tell us. original gene, if left intact, would encode. by the cunning manner in which its chief result has been reported. self-replication of the DNA double helix. special type of "chaperone" protein that property folds them. research on degenerative brain diseases that are caused by "prions,"
activity that generates the inherited trait takes place. and therefore of the inherited trait. itself be properly replicated with no abnormal changes in composition. thousands of years of testing, in nature. the governing theory is almost never noted. the cell, the fundamental unit of life. doubts. The central dogma was simply too good not to be true. last twenty years; new academic institutions, many of them "genomic"
fear the potential consequences of transferring a DNA gene between species. before we truly understand it. offspring derived from fetal and adult mammalian cells. Nature. 1997. 2: ANDi. Chan AWS, Chong KY, Martinovich C, Simerly C, and Schatten G.
Miller KF, Bolt DJ, Campbell RG, Palmiter RD, Brinster RL, Hammer RE. Genetic engineering of livestock. Science. 1989. 244(4910):1281-8. 4: Genetically engineered corn and soybean plants. Thayer AM. Agbiotech. Human Genome Project, p96, Cambridge Harvard University Press. 1992. 11: Crick quotation. Crick 1958 (above), page 152. 12: Crick quotation. Crick 1958 (above), page 153. 13: Crick quotation. Crick F.H.C. The Central Dogma of Molecular Biology. 1970, Nature 227:561-563 (see page 563). 14: Nature article on Human Genome Project (public funding). 15: Science article on Human Genome Project (private funding). Venter JC, Adams MD, Myers EW, et al. The Sequence of the Human Genome. York Times. Feb 13, 2001. 17: Lander quotation. Dentzer S. "Sequencing Life", PBS Online News Hour. 18: Alternative splicing quotation. Venter et al 2001 (above), page 1345. 19: The role of the spliceosome in alternative splicing. core of the spliceosome. Genes Dev. 1999. 13(15):1970-82. 20: Alternative splicing; 576 inner ear variant proteins. 21: Alternative splicing; 38,016 variant fruit fly proteins. extraordinary molecular diversity. Cell. 2000 Jun 9;101(6):671-84. See Collins et al 1999 (above). 23: Alternative splicing in virus replication, 1078.
nuclear sequences are conserved and Poly(A) addition precedes splicing. 24: Alternative splicing in human cells, 1981.
mRNA structure: possible alternative splicing. Nuc Acids Res. 1981. 9:3719-30. 25: Papers on alternative splicing in humans published by 1989. 26: the $3 billion project Venter et al 2001 (above). structure of nucleic acids: A structure for deoxyribose nucleic acid. 28: Processes that improve fidelity of DNA replication. 29: Enzymes that synthesize DNA influence its nucleotide sequence. Commoner B. The roles of deoxyribonucleic acid in inheritance. Nature. chemical explanation of inheritance. Nature. 1968. 220:334-340. 30: Chaperones. Ellis RJ. Proteins as molecular chaperones. 31: Prions. S.B. Prusiner. The Prion Diseases One Protein, Two Shapes. Statistics Service, the Agricultural Statistics Board, and the U.S.
Department of Agriculture. Acreage. June 29, 2001. 33: Hardy quotation. Hardy RWF. In Agricultural Research and Development. plants. Crit Rev Biochem Mol Biol. 2001;36(4):337-97. 35: Alternatively splicing in plants. Comelli P, Konig J, Werr W.
(transposon-associated protein). Plant Mol Biol. 1999 Nov;41(5):615-25. 36: Chaperones in plants. Lund AA, Blum PH, Bhattramakki D, Elthon TE. Heat-stress response of mitochondria. Plant Physiol. 1998 Mar;116(3):1097-110.
transmission of growth-related genes in pigs. Reprod Fertil Suppl . 38: Monsanto quotation. Monsanto Company Product Safety Center. Safety Assessment of Roundup Ready Soybean Event 403-2. Monsanto Company. 39: Abnormal host DNA in transgenic soybeans. Windels et al 2001 (above). spots. Proc Natl Acad Sci U S A. 1998 Jun 9;95(12):7203-8. Plenum Press. New York. 1984. Acad Sci USA. 1965 Jun;53(6):1183-1194. Esoteric and spiritual teachers have known for ages that our body is programmable by language, words and thought. This has now been scientifically proven and explained. The human DNA is a biological Internet and superior in many aspects to the artificial one. The latest Russian scientific research directly or indirectly explains phenomena such as clairvoyance, intuition, spontaneous and remote acts of healing, self healing, affirmation techniques, unusual light/auras around people (namely spiritual masters), mindâ¬"s influence on weather patterns and much more. In addition, there is evidence for a whole new type of medicine in which DNA can be influenced and reprogrammed by words and frequencies WITHOUT cutting out and replacing single genes. Only 10% of our DNA is being used for building proteins. It is this subset of DNA that is of interest to western researchers and is being examined and categorized. The other 90% are considered "junk DNA." The Russian researchers, however, convinced that nature was not dumb, joined linguists and geneticists in a venture to explore that 90% of "junk DNA." Their results, findings and conclusions are simply revolutionary! According to their findings, our DNA is not only responsible for the construction of our body but also serves as data storage and communication. The Russian linguists found that the genetic code - especially in the apparent "useless" 90% - follows the same rules as all our human languages. To this end they compared the rules of syntax (the way in which words are put together to form phrases and sentences), semantics (the study of meaning in language forms) and the basic rules of grammar. They found that the alkalines of our DNA follow a regular grammar and do have set rules just like our languages. Therefore, human languages did not appear coincidentally but are a reflection of our inherent DNA. The Russian biophysicist and molecular biologist Pjotr Garjajev and his colleagues also explored the vibrational behavior of DNA. In brief the bottom line was: "Living chromosomes function just like a holographic computer using endogenous DNA laser radiation." This means that they managed, for example, to modulate certain frequency patterns (sound) onto a laser-like ray which influenced DNA frequency and thus the genetic information itself. Since the basic structure of DNA-alkaline pairs and of language (as explained earlier) is of the same structure, no DNA decoding is necessary. One can simply use words and sentences of the human language! This, too, was experimentally proven! Living DNA substance (in living tissue, not in vitro) will always react to language-modulated laser rays and even to radio waves, if the proper frequencies (sound) are being used. This finally and scientifically explains why affirmations, hypnosis and the like can have such strong effects on humans and their bodies. It is entirely normal and natural for our DNA to react to language. While western researchers cut single genes from DNA strands and insert them elsewhere, the Russians enthusiastically created devices that influence cellular metabolism through modulated radio and light frequencies, thus repairing genetic defects. They even captured information patterns of a particular DNA and transmitted it onto another, thus reprogramming cells to another genome. So they successfully transformed, for example, frog embryos to salamander embryos simply by transmitting the DNA information patterns! This way the entire information was transmitted without any of the side effects or disharmonies encountered when cutting out and re-introducing single genes from the DNA. This represents an unbelievable, world-transforming revolution and sensation: by simply applying vibration (sound frequencies) and language instead of the archaic cutting-out procedure! This experiment points to the immense power of wave genetics, which obviously has a greater influence on the formation of organisms than the biochemical processes of alkaline sequences. Esoteric and spiritual teachers have known for ages that our body is programmable by language, words and thought. This has now been scientifically proven and explained. Of course the frequency has to be correct. And this is why not everybody is equally successful or can do it with always the same strength. The individual person must work on the inner processes and development in order to establish a conscious communication with the DNA. The Russian researchers work on a method that is not dependent on these factors but will ALWAYS work, provided one uses the correct frequency. But the higher developed an individual's consciousness is, the less need is there for any type of device: one can achieve these results by oneself. Science will finally stop laughing at such ideas and will confirm and explain the results. And it doesn't end there. The Russian scientists also found out that our DNA can cause disturbing patterns in a vacuum, thus producing magnetized wormholes! Wormholes are the microscopic equivalents of the so-called Einstein-Rosen bridges in the vicinity of black holes (left by burned-out stars). These are tunnel connections between entirely different areas in the universe through which information can be transmitted outside of space and time. The DNA attracts these bits of information and passes them on to our consciousness. This process of hyper-communication (telepathy, channeling) is most effective in a state of relaxation. Stress, worry or a hyperactive intellect prevent successful hyper-communication or the information will be totally distorted and useless. In nature, hyper-communication has been successfully applied for millions of years. The organized flow of life in insects proves this dramatically. Modern man knows it only on a much more subtle level as "intuition." But we, too, can regain full use of it. As an example from nature, when a queen ant is separated from her colony, the remaining worker ants will continue building fervently according to plan. However, if the queen is killed, all work in the colony stops. No ant will know what to do. Apparently, the queen transmits the "building plans" even if far away - via the group consciousness with her subjects. She can be as far away as she wants, as long as she is alive. In humans, hyper-communication is most often encountered when one suddenly gains access to information that is outside one's knowledge base. Such hyper-communication is then experienced as inspiration or intuition (also in trance channeling). The Italian composer Giuseppe Tartini, for instance, dreamt one night that a devil sat at his bedside playing the violin. The next morning Tartini was able to note down the piece exactly from memory. He called it the Devil's Trill Sonata. For years, a 42-year old male nurse dreamt of a situation in which he was hooked up to a kind of knowledge CD-ROM. Verifiable knowledge from all imaginable fields was then transmitted to him that he was able to recall in the morning. There was such a flood of information that it seemed a whole encyclopedia was transmitted at night. The majorities of facts were outside his personal knowledge base and reached technical details of which he knew absolutely nothing. When hyper-communication occurs, one can observe in the DNA, as well as in the human, supernatural phenomena. The Russian scientists irradiated DNA samples with laser light. On screen, a typical wave pattern was formed. When they removed the DNA sample, the wave pattern did not disappear, it remained. Many controlled experiments showed that the pattern continued to come from the removed sample, whose energy field apparently remained by itself. This effect is now called phantom DNA effect. It is surmised that energy from outside of space and time still flows through the activated wormholes after the DNA was removed. The side effects encountered most often in hyper-communication in humans are inexplicable electromagnetic fields in the vicinity of the persons concerned. Electronic devices like CD players and the like can be irritated and cease to function for hours. When the electromagnetic field slowly dissipates, the devices function normally again. Many healers and psychics know this effect from their work: the better the atmosphere and energy, the more frustrating it can be for recording devices as they stop functioning at that exact moment. Often by next morning all is back to normal. Perhaps this is reassuring to read for many, as it has nothing to do with them being technically inept; it means they are good at hyper-communication. In their book Vernetzte Intelligenz, Grazyna Gosar and Franz Bludorf explain these connections precisely and clearly. The authors also quote sources presuming that in earlier times humanity had been just like the animals: very strongly connected to group consciousness and thereby acted as a group. In order to develop and experience individuality, however, we humans had to forget hyper-communication almost completely. Now that we are fairly stable in our individual consciousness, we can create a new form of group consciousness - namely one in which we attain access to all information via our DNA without being forced or remotely controlled about what to do with that information. We now know that just as we use the internet, our DNA can feed proper data into the network, can retrieve data from the network, and can establish contact with other participants in the network. Remote healing, telepathy or "remote sensing" about the state of another can thus be explained. Some animals know from afar when their owners plan to return home. This can be freshly interpreted and explained via the concepts of group consciousness and hyper-communication. Any collective consciousness cannot be sensibly used over any period of time without a distinctive individuality; otherwise we would revert to a primitive herd instinct that is easily manipulated. Hyper-communication in the new millennium means something quite different. Researchers think that if humans with full individuality would regain group consciousness, they would have a god-like power to create, alter and shape things on Earth! AND humanity is collectively moving toward such a group consciousness of the new kind. Fifty percent of children will become a problem as soon as they go to school, since the system lumps everyone together and demands adjustment. But the individuality of today's children is so strong that they refuse this adjustment and resist giving up their idiosyncrasies in the most diverse ways. At the same time more and more clairvoyant children are born. Something in those children is striving more towards the group consciousness of the new kind, and it can no longer be suppressed. As a rule, weather for example is rather difficult to influence by a single individual. But it may be influenced by group consciousness (nothing new about this to some indigenous tribes). Weather is strongly influenced by Earth resonance frequencies (Schumann frequencies). But those same frequencies are also produced in our brains, and when many people synchronize their thinking or when individuals (spiritual masters, for instance) focus their thoughts in a laser-like fashion, then it is not at all surprising that they can influence the weather. A modern day civilization which develops group consciousness would have neither environmental problems nor scarcity of energy: for if it were to use such mental powers as a unified civilization, it would have control of the energies of its home planet as a natural consequence. When a great number of people become unified with higher intention as in meditating on peace - potentials of violence also dissolve. Apparently, DNA is also an organic superconductor that can work at normal body temperature, as opposed to artificial superconductors which require extremely low temperatures between 200 and 140Â°C to function. In addition, all superconductors are able to store light and thus information. This further explains how DNA can store information. There is another phenomenon linked to DNA and wormholes. Normally, these super-small wormholes are highly unstable and are maintained only for the tiniest fractions of a second. Under certain conditions stable wormholes can organize themselves, which then form distinctive vacuum domains in which for example, gravity can transform into electricity. Vacuum domains are self-radiant balls of ionized gas that contain considerable amounts of energy. There are regions in Russia where such radiant balls appear very often. Following the ensuing confusion the Russians started massive research programs leading finally to some of the discoveries mentions above. Many people know vacuum domains as shiny balls in the sky. The attentive look at them in wonder and ask themselves, what they could be. I thought once: "Hello up there. If you happen to be a UFO, fly in a triangle." And suddenly, the light balls moved in a triangle. Or they shot across the sky like ice hockey pucks: they accelerated from zero to crazy speeds while sliding silently across the sky. One is left gawking and I have, as many others, too, thought them to be UFOs. Friendly ones, apparently, as they flew in triangles just to please me. Now, the Russians found - in the regions where vacuum domains often appear - that sometimes fly as balls of light from the ground upwards into the sky, and that these balls can be guided by thought. Since then it has been found that vacuum domains emit waves of low frequency that are also produced in our brains and because of this similarity of waves they are able to react to our thoughts. To run excitedly into one that is on ground level might not be such a great idea, because those balls of light can contain immense energies and are capable of mutating our genes. Many spiritual teachers also produce such visible balls or columns of light in deep meditation or during energy work, which trigger decidedly pleasant feelings and do not cause any harm. Apparently this is also dependent on some inner order, quality and origin of the vacuum domain. There are some spiritual teachers, like the young Englishman Ananda, for example, with whom nothing is seen at first, but when one tries to take a photograph while they sit and speak or meditate in hyper-communication, one gets only a picture of a white cloud on a chair. In certain Earth healing projects, such light effects also appear on photographs. Simply put, this phenomena has to do with gravity and anti-gravity forces that are ever more stable forms of wormholes and displays of hyper-communication with energies from outside our time and space structure. Earlier generations that experienced such hyper-communication and visible vacuum domains were convinced that an angel had appeared before them: and we cannot be too sure to what forms of consciousness we can get access when using hyper-communication.